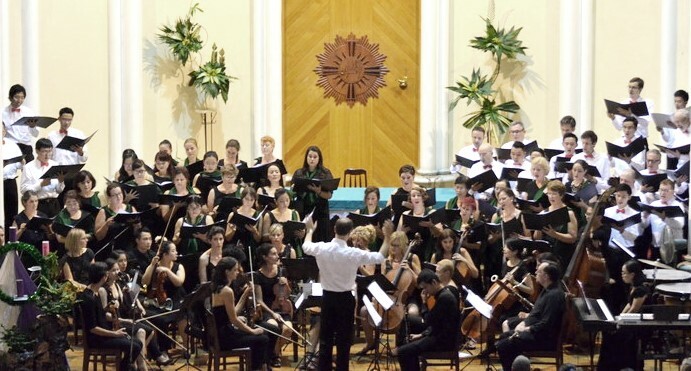 A Choral Christmas, the annual winter concert of The International Choir and Orchestra of Ho Chi Minh City (ICOHCMC), completed its two performances on the weekend, 6-7 December at St Paul’s Convent and Notre Dame Cathedral. The money from the silent auction, collected from Friday performance, was donated to two charities: Loreto Vietnam-Australia Program and Poussières de Vie, both focusing on improving the livelihood of the disadvantaged in rural Vietnam.The concerts attracted nearly 3,000 people, coming in to enjoy a repertoire of classical pieces, ranging from Bach and Handel to traditional Christmas carols such as “Silent Night”. Brian Riedlinger, the current conductor of ICOHCMC, hopes to connect to more groups of audience in future concerts.“People came for the familiar names, like Bach or Mozart. They’re the composers people can recognize. Also, because of the coming holiday, they wanted to feel the Christmas atmosphere and to listen to cheerful carols they know by heart,” he said.